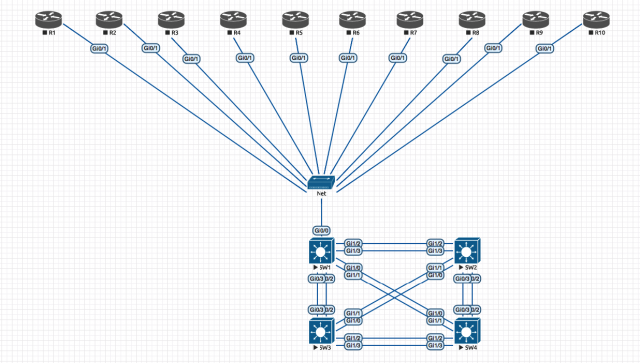 I already explained in an older post my home lab for CCIE preparation. My BB1-BB3 routers are Cisco 2600 series and the rest of R1-R6 are emulated with Dynamips. The only problem is that one of the C2600 has too little Flash space to hold the required IOS. Memory is sufficient, but Flash not. The only workaround I have is to load the IOS image from a TFTP server. I will explain here my procedure, maybe it’s useful for somebody else out there. Next step is to get a IOS image and copy it under /var/lib/tftpboot. If you need a hint, I’m using c2600-adventerprisek9-mz.124-25d.bin which needs only a small amount of memory to be installed on the Cisco 2600 platform and it’s enough for testing. Now we need to get the IOS image on the C2600 using TFTP. Depending on your topology used for CCIE exam practice, this can be done in different ways. My problematic router is the BB3. Somehow I need that BB3 is communicating with my Ubuntu server, as simple as possible, without changing ethernet cables all the time. You noticed int the above diagram that BB3 has an interface on the SW1 (Fa0/13) and SW1 has F0/1 connected to my Ubuntu server as explained in this post. 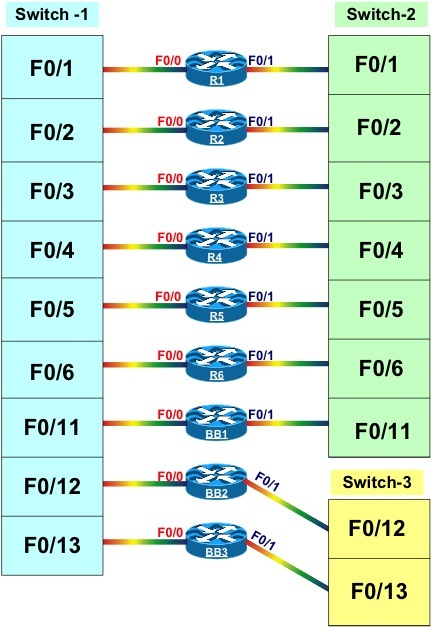 What I need is to have Fa0/13 and Fa0/1 on the SW1 on the same VLAN for proper communication. Usually I just default the interface and then everything is fine. By default on the BB3 router I have an IOS image that can fit the Flash size (c2600-i-mz.123-26.bin) and in case that for some reasons the TFTP Server is not reachable, it will boot that image. %SYS-6-READ_BOOTFILE_FAIL: tftp://192.168.182.1/c2600-adventerprisek9-mz.124-25d.bin File read failed -- Timed out. %SYS-6-BOOT_MESSAGES: Messages above this line are from the boot loader. boot: cannot load "tftp:c2600-adventerprisek9-mz.124-25d.bin 192.168.182.1"
and the router will boot your image stored locally on Flash. Instead of doing all this work, which may generate some headache, I could just buy another router with enough Flash (and Memory). Currently I don’t want to make this investment, so I’ll stick with the above scenario. I can tell you it’s not essentially a technical knowledge session, and Anthony Sequeira mention this couple of times during presentation. Nevertheless this it’s damn good for your CCIE preparation and exam itself. What Anthony Sequeira does, he tries to “educate” the attendant behavior pre and during the exam so he or she won’t go crazy. If you have a Cisco Live 365 account (it’s free to subscribe) I would recommend this presentation. I found this great Infographic on Pinterest and I felt the need to share it though my blog. Even if not all information are 100% accurate of complete, it’s still a nice view that worth spending some minutes to check.